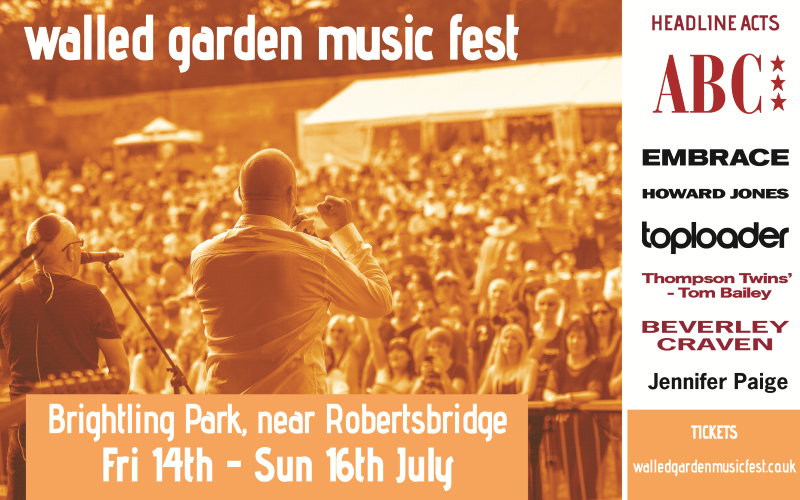 Win3 day passes to Walled Garden Music Fest! One of the finest additions to the boutique festival circuit, the Walled Garden Music Fest, has unveiled the star-packed line-up for its third year, with an array of chart-topping acts. Staged in the historic grounds of 550-acre estate of Brightling Park in East Sussex, the event goes from strength to strength with its high-calibre guests. This year’s crop of artists includes ABC, whose album The Lexicon Of Love was one of the defining releases of the early 1980s, performing a greatest hits selection. Embrace, who have achieved three number one albums over their two decade career with hits such as Come Back To What You Know and Gravity. Thompson Twins, led by Tom Bailey, were a staple of the top 10 in the 80s with timeless tracks such as Hold Me Now, while Howard Jones built a reputation on both sides of the Atlantic for classic songs such as What Is Love and New Song. Others on the bill include Crush singer Jennifer Paige, Promise Me singer Beverley Craven, Dancing In The Moonlight hitmakers Toploader, The Illegal Eagles, Wildwood Kin, The King’s Parade, Talk In Code and Emma McGrath, with more to be added.